You are STILL invited! 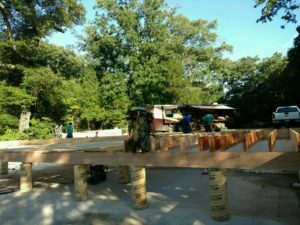 The log-raising originally scheduled for Saturday, June 4th has been rescheduled for this coming Saturday, June 11th from 10 am to 2 pm. The event is totally free, including a light lunch around noon. Please send me an email here if you are planning on attending so that I can give you the code for the Reserve electronic gate. Also, please tell me how many will be in your party so we can plan enough food. If planning to spend the night in the area, we recommend the Palestine LaQuinta or Holiday Inn Express. Athens, Corsicana and Tyler are also within range of the Reserve, so you may prefer to make reservations in a nearby town if you’re looking to make some progress towards home after the log-raising. If you would like a tour of the Reserve, just let one of us know and we will arrange that for you. You may be on a “gator” for the tour, so keep in mind it may be warm and your “do” may get windblown! And on the way home, stop at the nearby blueberry farm and either pick your own fresh blueberries or those just picked for you by the farmers themselves! Now, on to an update on Solitude! As thunder was rumbling in the background, the hubby was waiting…and waiting…and waiting for the first concrete truck to roll in as scheduled around 1 pm last week. There were supposed to be a series of trucks spaced apart from each other at even intervals of time so that one truck could roll in, pour its contents into the center of our building site and into the ICFs and then the next could roll in and begin where the last one left off. Unfortunately, for a reason we still can’t explain, none of the trucks arrived until 2:15 pm. By this time all the trucks arrived at once and rain was starting to approach the Reserve. If I had done a stress test on the hubby about this time, I think we could safely say he would have flunked it! Around this time the hubby also had to leave to conduct business. When he returned, he was hoping to work on the drainage (or lack of drainage!) issue, but things were still too rainy and muddy to work on it. At this point we decided to postpone the log-raising. The hubby came home, baled our yard (Let’s just say that orange dog of ours is not happy having to hop through the weeds to get to her favorite part of the yard for conducting her own business! ), washed his clothes, went to church and turned right around to go back to the Reserve. Thankfully, by this time, the sun had finally decided to peek out of the clouds and things were dry enough for him to work on the drainage situation. We think (Cross your fingers and say a prayer!) we have the drainage issue now under control and the piers are in the ground for the sub-floor of the cabin. As of yesterday, the builder had begun putting the sub-floor in place. Since sunshine is in the forecast for the next week, this means we should be ready for logs by the time of the log-raising! I thought, prior to the beginning of construction, that the term “getting it into the dry” (building to the point where there are walls, a roof, windows and doors installed) was just a figure of speech. I didn’t realize just how important that “dry” thing was until met with crazy Texas weather. This entry was posted on Wednesday, June 8th, 2016 at 10:50 am and is filed under Log Rhythms. You can follow any responses to this entry through the RSS 2.0 feed.